Add shine to natural or colour-treated blonde hair with the I Am Brilliant Blonde Bonus Bag from Paul Mitchell. Combining a lightweight shampoo and conditioner, the duo work in tandem to cleanse and nourish hair, whilst maintaining colour vibrancy. Gently cleanses lightened or highlighted blonde hair and removes excess oil and impurities, without stripping moisture. Formulated using exclusive KerActive protein, the sulphate-free shampoo repairs damaged strands to prevent breakage, whilst safflower extract seals the cuticle and restores elasticity so you can experience sleek, radiant and healthy-looking locks. 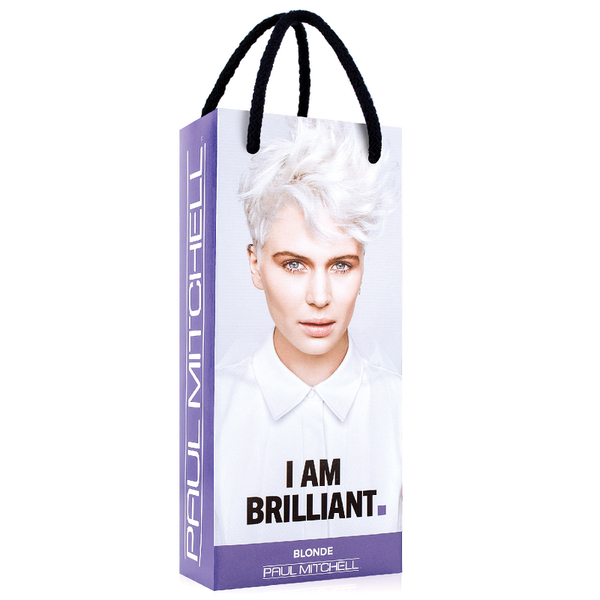 A hydrating conditioner that has been specially developed to brighten blonde hues and restore the appearance of lack-lustre hair by delivering moisture from root to tip. Innovative KerActive proteins coat the hair to reverse signs of damage and smoothen strands, leaving you with sleek, calm and manageable locks. Enriched with safflower oleosomes which effectively boost elasticity for luminous, detangled hair. Shampoo: Wet hair. Lather, then rinse. Conditioner: Apply to clean, damp hair. Comb through. Rinse.